During the few weeks I get to spend at home in England, a slight pause in my endless travels when I hope to catch up with what used to be called paperwork but now, I suppose, should be e-work – I am not usually thrilled to be interrupted by the ring of the telephone. But when I reached for the receiver and heard the distinctive voice of John Hare on the other end of the line, I was thrilled. John had just returned from Mongolia where he goes every August to see how things are going with the work of his organization, the Wild Camel Protection Foundation (WCPF). John Hare, trustee of the Wild Camel Protection Foundation. I well remember when first I met him, and he told me about his project to save the wild Bactrian Camel in the wilderness of the Gobi Desert. His idea was crazy, and I have always been attracted to crazy, imaginative and passionate people. John is all three. That meeting led to the chapter on John and his work in my book, Hope for Animals and Their World. That was written in 2008, and much has happened since then. First of all it has been scientifically proven that the wild camels of China and Mongolia, with their flat heads and smaller humps, are genetically distinct from the domestic Bactrian camel, something that has long been suspected but only proved in 2008 from DNA profiling of samples of hair, skin and bone. It is now correct to refer to the Wild Camel (Camelus ferus). That classification made John’s work even more important. 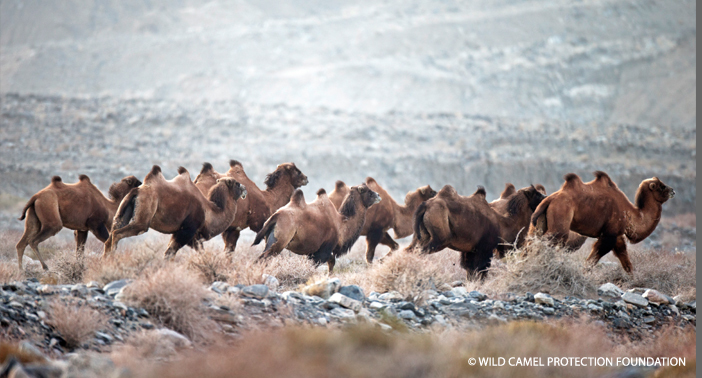 The wild camel lives in some of the most inhospitable landscapes on earth in the deserts of China and Mongolia. Wild camels migrate over huge distances in pursuit of unreliable water sources and meager grazing. They can survive extremes of temperature varying from -40 Celsius to plus 55 Celsius (-40 Fahrenheit to 131 Fahrenheit). The Lop Nur Wild Camel National Nature Reserve, in the Chinese Gobi, was established in 2001 – partially funded by the WCPF. I remember being involved in building one of the ranger posts. It is managed by Yuan Lei who is the son of Yuan Guoying, the Professor who took John for the first time, into what was then the “off limits” habitat of the wild camels – China’s former nuclear test site. I remember John telling me what a really harsh environment it was – the camels have actually had to adapt to drinking water that has a higher salt content than sea water. “They don’t like it” John said – but nevertheless they manage to utilize it. The nuclear tests ended in 1996, and for the last 14 years they were underground. But the program lasted 45 years and 43 tests were carried out. The camels not only survived any effects of radiation but are now breeding there. And other wildlife is returning. John gives me mostly good news each time we meet or speak. 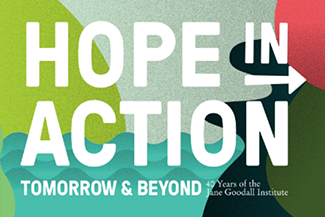 Early this year he filled me in on some of what has happened since Hope for Animal and their World was published in 2008. And there was much good news. In The Lop Nur desert things are going well under the leadership of the Chinese team, said John, and this is confirmed by a recent report from Yuan Lei. 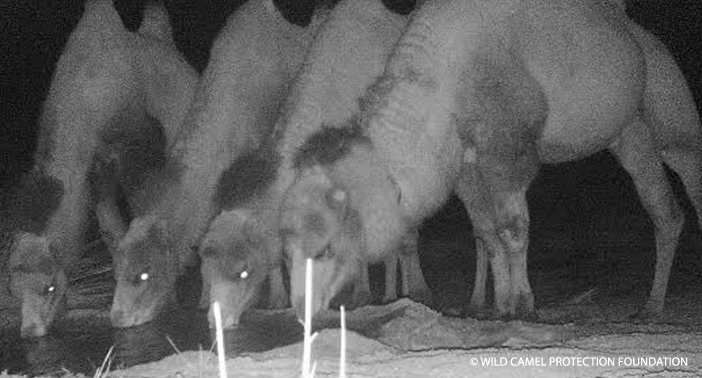 He writes “During one week’s field work in the Gobi we collected infrared camera data and undertook a wild camel survey along the north of the Arjin Mountains. It was very exciting as we could see the number of wild camels in one herd numbered 36, with 11 young , some of whom were a month old and some of them only one week old. 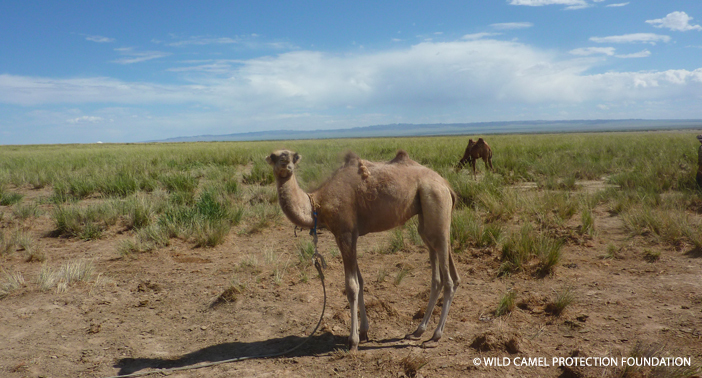 A total of 123 wild camels were counted during the survey. The only place in the world that breeds the Wild Camel. The Hunter Hall Wild Camel Breeding Center, named for a very generous donor, was started in 2004 with 12 wild camels previously captured by Mongolians. It is the only place in the world where these camels are kept in captivity. John usually visits the Centre in August and he gave me up-to-date news when he got back. 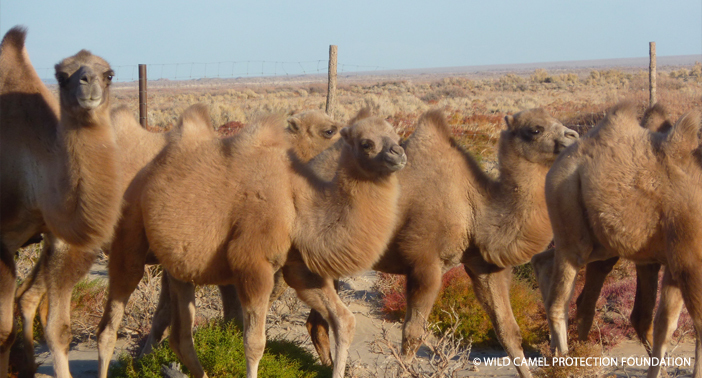 The number of wild camels at the breeding centre is now 28 – there were successful births this spring (2015) of three female and three male calves, all of whom are in good condition and doing well. John explained that one problem with breeding Wild Camels is that when the males reach sexual maturity at three or four years of age they challenge the alpha male wanting to take over his females. And so the mating season, when the male comes into “mast” and the females are sexually receptive, is chaotic with a great deal of aggression. Fences can be damaged, and it can be quite dangerous for the staff. It also happens to take place at the very coldest time of year – minus 40 degrees Celsius (-40 degrees Fahrenheit). In order to minimize the chaos it was decided, in October 2013, to release two young, sexually mature males. John had told me it was happening, but only now have I managed to get the details. Nothing could have happened, he told me, without the full co-operation of the Mongolian Ministry of Nature and the Environment, the Mongolian Academy of Sciences and Professor Liu Shaochuang of the Chinese Academy of Sciences. Transporting the young camels to be released. The selected young bulls were named Naran and Jolon. 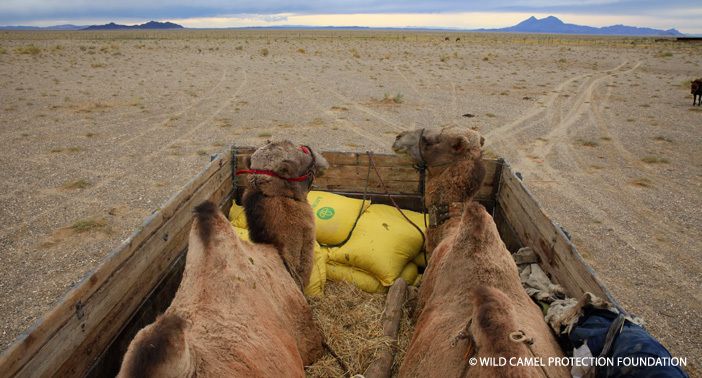 They were sedated, loaded into a truck, and set off on a 250 mile journey into the Bogts Tsagaan Ders water point in the Great Gobi Strictly Protected Area. When the camels were finally released into the desert there was a sense of relief – so far so good. But what would happen? Professor Liu, with whom John has worked for 15 years, had donated two satellite collars – and John told me that one of the wonderful aspects of the operation was that for the very first time he was seeing real collaboration between Mongolian and Chinese scientists. (Professor Liu Shaochuang is associated with China’s moon exploration project and he has also provided satellite collars for a number of wild camels in the Chinese Gobi). Things went very well indeed – photos obtained from a camera trap showed that Naran managed to attract five females at the start of the four months breeding season. Perhaps Jolan did as well, but his collar stopped functioning, and there were no photos. And then, despite this indication of Naran’s successful reintroduction, at the end of 2014 he returned to the breeding centre. It was 250 miles away, yet he travelled fast and in an almost straight line. Jolan also turned up – a bit battle scarred – perhaps he’d had a fight with another bull. The 2013/14 winter in Mongolia was very dry with little snow and this had an impact on the water table in the reserve which had already fallen to a low level. Perhaps they remembered the breeding centre had provided more consistent conditions. In a month’s time there will be another release of 6 young bulls. 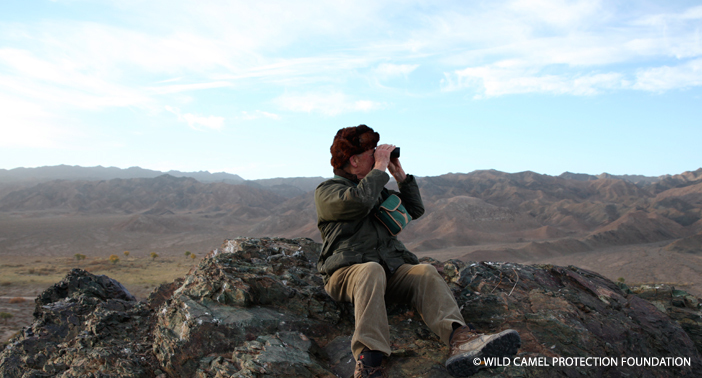 “We will go to an even more remote area in the Gobi, close to wild camel habitat and near a spring with fresh water and ample forage and almost 350 miles from the center” John told me last week. We shall not know how successful this release has been for several months. 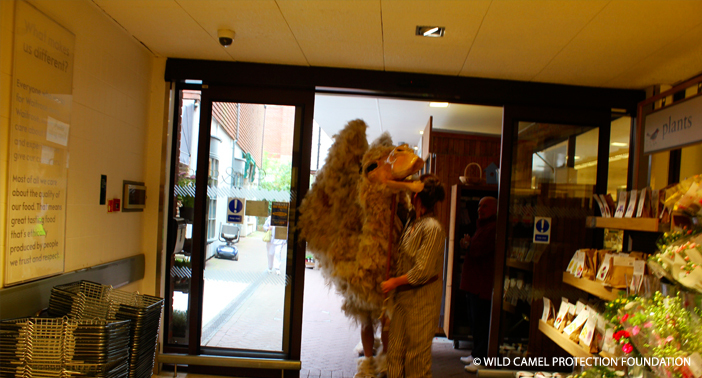 So watch out for more Good News about the Wild Camels at a later date. 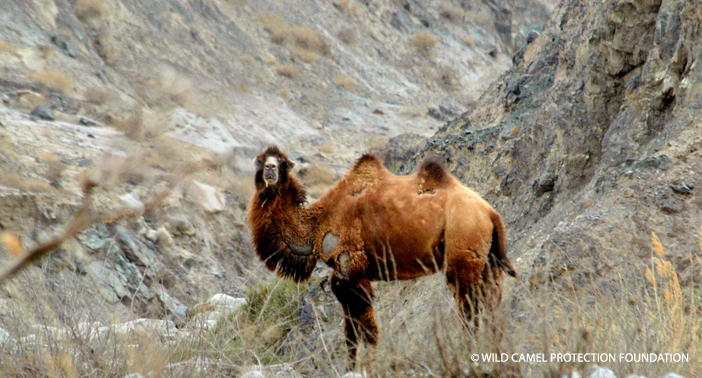 Domestic Bactrian Camels help in conservation efforts of their wild cousins. A few years ago John heard about someone as passionate about camels as he is – well, perhaps not quite! Anyway, the Countess of Chichester owns two domestic Bactrians which she cares for on her estate. Of course, when she heard about John’s work in China and Mongolia she was fascinated. And when she met John, she and he began plotting as to how they could raise funds to help him in his work. A woman of action, she wrote an opera about the Silk Road. Camels were an integral part of trade along this desert route, and she managed to persuade the London Opera House, that so conservative organization, to allow her two camels to take part in the performance. 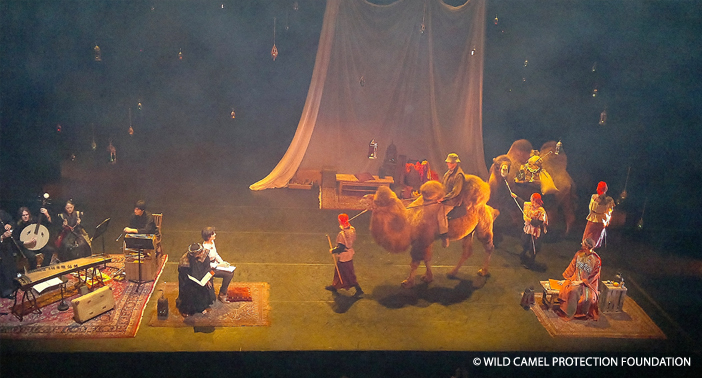 This is how John got to appear in front of a whole crowd of opera devotees, unashamedly riding a camel!!! He was mounted on Therese, and Temujin was led in behind them. The photograph above speaks for itself! John rides on Therese the camel at the Opera house as Temujin follows in behind. Since 2012 the Countess has helped John to organize a Camel Race Day every other year in order to raise money for the wild camel project. These camels, owned by Joe and Rebecca Fossett are a mixture of domestic Bactrian and dromedary. The last race day was a huge success, in part because of clever advertising. Gobi the “war camel” came about by an extraordinary coincidence – though John and I do not believe in coincidence anymore! Anyway, Kate Rae, who has worked with John for many years, was walking down a road, and happened to notice an open garage door. She looked in, and saw sculptures. To cut a long story short, the boyfriend of the sculptress, Louise Thomas, had worked with the team that created War Horse. Perhaps he would design a War Camel and she, Louise, would create it. Thus Gobi was born. Powered by two people, and led by a third, Gobi visited a Waitrose supermarket – unannounced. Customers and staff were amazed. After walking carefully between the aisles the team realized they would have to go out backwards, and they – as well as the manager! – were terrified they would knock over a pyramid of wine bottles. Gobi visited other sites, and this provided splendid advertising for the 2014 Camel Race Day that was attended by about 4,000 and raised significant money for the wild camels. The next race day will be in 2016.